Forum Index > Historical Arms Talk > Were mail hauberks still used in the XVth century ? Posted: Thu 30 Jun, 2016 3:35 am Post subject: Were mail hauberks still used in the XVth century ? I would like to reenact a professional soldier or a knight of low status from the Holy Roman Empire (more precisely, the Prince-Bishopric of Liège) during the years 1420-1440 and several questions came to mind. - Were the mail hauberks still used as primary protection ? - Would a soldier fighting primarily on foot often wear greaves and cuisses ? - Which types of longswords were in use by then ? The type XVa, XVIa, or else ? - Would a soldier wear a particular type of shoes /boots ? - Last, but not least, which heraldic garnments were used by that time ? If you have sources to suggest me for answering these questions, I would be grateful. Thank you for your help ! Hi Aurélien. I think that being a poor knight is very much a modern idea. In fact the majority of heavily armoured soldiers were not knights. Knighthood was the lowest form of nobility, but that doesn't mean that a knight wouldn't be relatively wealthy. At this point in time even well off commoners could afford plate armour, some even could afford war horses and serve as heavy cavalry. All that said. 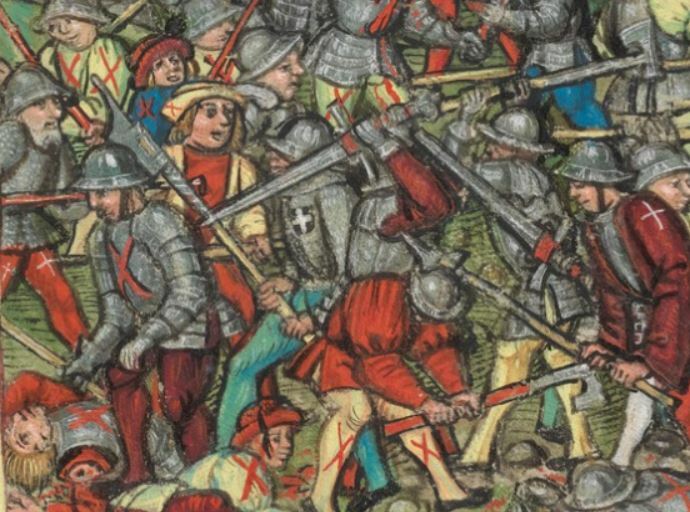 The Holy Roman Empire is not an area that I have done a lot ofresearch into, but I'll do a quick look over on the manuscript miniatures website and see what I find. A quick look over on the manuscript miniatures website has confirmed what I thought. Surcoats were still widely used during this time so it isn't always possible to know what armour is being worn underneath, but when there's no surcoat in the way, plate armour is always the primary torso protection. As for greaves and cuisses, yes they were commonly used by foot soldiers. AFAIK the types of sword you mentioned, type XVa and XIVa, would be old fashioned by this time so might be in keeping with a lower class soldier's kit. A wealthier, more fashion conscious, individual would probably go with a type XVIII, or one of its sub types. As for shoes and heraldric garments, I'm sorry I'll have to leave that to others to answer. Mail hauberks are no longer the primary form of protection for knights and men-at-arms by the 15th century. However, many other soldiers who could not afford plate still would have made use of mail. So if you want to portray a soldier who is neither knight, man-at-arms nor nobleman, mail is fine. Type XVa swords are not old fashioned at least as late as the mid-15th century, as there were some made for the Battle of Castillion. Craig. Sorry , of course you are right. I was going off memory, but it failed me . XIVa's were definitely old fashioned by this time though. Hi, Stephen and Craig ! I suspected as much (concerning mail hauberks). Could you tell me what armour a burgher (turned professional soldier /mercenary) would have likely worn ? Could he have worn a mail hauberk with a partial plate armor ? Or a full plate armor ? Well, assuming a burgher became a soldier, I would expect that they would probably be able to afford plate, or at the very least, a breastplate, faulds, tassets and greaves. The problem with my assessment though is it really depends how wealthy the burgher is. I've assumed that anyone who is a burgher would have substantial wealth, but that may not be the case. I am not sure if XVI.a swords are old fashioned or not. My perception is that they are primarily 14th century swords, and Oakeshott, at least in Records, does not give any XVI.a as later than 1340 AD. However, this tells us little about how late they were actually used. As you may know, Peter Johnsson describes the Brescia Spadona from the mid-1400s as possibly being an XVIIIa or XVI.a. Certainly, the points on many XVI.a swords do not seem to be significantly less acute than on XVIII fily swords, so they could well have persisted for a long time. I simply don't know enough to say for certain. I suspected as much (concerning mail hauberks). Could you tell me what armour a burger (turned professional soldier /mercenary) would have likely worn ? Could he have worn a mail hauberk with a partial plate armor ? Or a full plate armor ? Yes it was very popular amongst infantry soldiers from the Holy Roman Empire to wear a breastplate (without backplate) over either a mail shirt, or a padded jack, or sometimes both. If you already own a mail hauberk and a coif (I'm just guessing from your question that you would like to use some basic pieces of kit to portray multiple eras), then you could add a breastplate and fauld (without backplate), a kettle hat, plate arm harness (no need for spaulders, as the sleeves of hauberk will cover your shoulders), gauntlets, cuisses, and greaves. 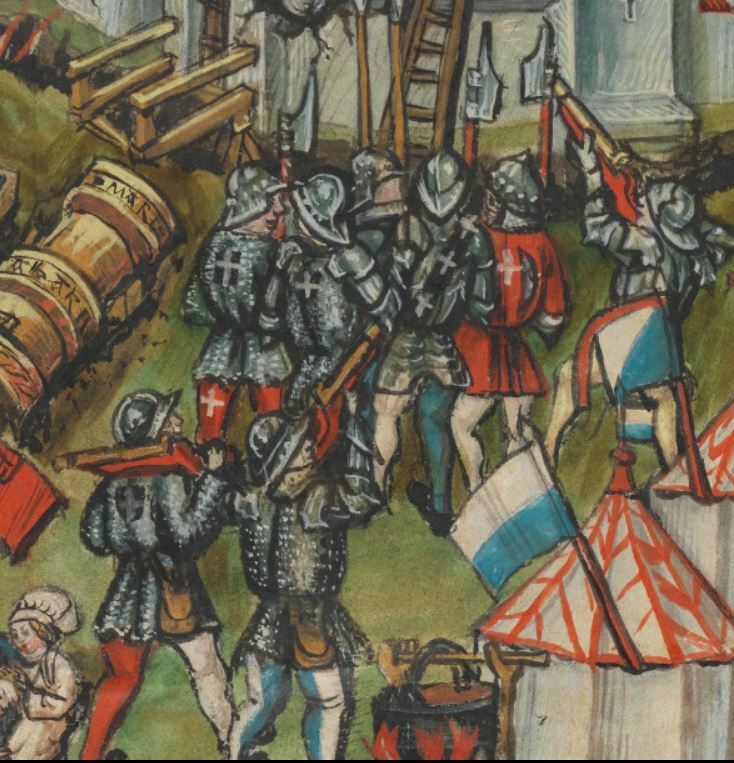 Here is a good image (dated between 1425 - 1435) showing the kind of equipment a professional soldier might have. Not top of the line, head to toe, plate armour, but still decently armoured. Also note that armour at this time was still frequently covered by a layer of cloth, so you don't necessarily have to use a breastplate. You could achieve the same look without one, by wearing a surcoat. In the first half of the 15th century, I do not ever recall seeing cuisses without greaves, though greaves without cuisses show up, especially on the Italian infantry armed with large oval shields. Cuisses without greaves is more of a 16th century thing. Typically in the 15th century (excluding the Italian infantry mentioned above) when it comes to legharness it's all or nothing (except sabatons, which are optional if you are not English). I didn't know that James. As I said earlier this isn't an area that I've done much research into. Shoes are typically of the sort that cover the bones of the ankle or a bit higher if worn without greaves, and not the sort that have an open top with a strap and buckle across them (those are my court dancing shoes ). They are often not distinguishable from civilian shoes. The miniature put up by Stephen is interesting; the fellows in the background without legharness are wearing high boots with the tops rolled down (I don't think it's their hose). Those are typically for riding, but I have wondered if they might not be nice worn high in cold wet windy weather. It looks like the brims on their helmets are covering their eyes and there no slits on the brims. Artistic overlook or am I missing a detail in the image? James. For some reason those high boots do seem to show up in a lot of manuscripts dealing with biblical scenes. Hmm... That's a good point. But what might it mean? I can't think of anything it might symbolize, or how it would be viewed as 'Eastern'. Though Aurélien's question has already been answered adequately, I just wanted to point out that some soldiers wore hauberks into the end of the XVth c. according to Diebold Schilling's Luzerner Chronicle. In the second image the hauberk wearers are the pikeman on the far left side, and the halberdier in the center. Probably both. On one hand I'm pretty sure the artist used those helmets to cover the figures' eyes since it took less effort to draw, colour, and shade the helmets than to draw eyes with the level of detail seen on the figures with visible eyes. Most artists today are still quite happy to use similar tricks to save the effort needed to fully render human figures' eyes! On the other hand, of course, it wasn't all that uncommon for helmets to obstruct vision to the sides while remaining quite open in front. This is likely the case with the figure wearing a deep kettle hat with cutouts. The one on the far right with the narrow-brimmed kettle-hat, though -- I'm pretty sure the artist wanted to spare himself (or herself?) the effort needed to draw people's eyes.